In the first part of our series (http://securitysynapse.blogspot.com/2019/02/splunk-and-elk-impartial-comparison-part-i.html), we discussed the similarities between Splunk and the ELK stack. Part II will discuss some of the differences in terms of limitations. Not all of these are deal breakers and they cannot necessarily be scored as one for one in terms of importance. But it is good for folks to know the differences before implementing one platform vs. the other. We welcome the reader to chime in with their own limitations (or corrections) as well. We will start off with the Splunk limitations and then follow up with the ELK limitations. Remember, these are not necessarily weighted equally in terms of importance (as that is determined by the end user), so we are not declaring a winner. - Splunk is considered “Schema on read”, which means you can throw pretty much anything at it and it may autoparse or can be parsed later. ELK requires more upfront parsing to make use of the data. - ELK has a separate beat for collecting different sources/components of a system. Splunk has a single Universal Forwarder that can collect different data sources by using a flexible configuration file. - ELK may introduce significant “breaking changes” on new version releases which can cause some customers to become stuck on a certain version of the platform. Splunk seems to be very careful not to do this and it is rare and often not as limiting if it does occur. Most articles on this subject seem to have some sort of agenda to push folks in one direction or another—so we will do our absolute best to keep it unbiased. We admit that we know Splunk better than we know the ELK stack, so we are banking on ELK (and even Splunk) colleagues and readers to help keep us honest. Lastly, our hope is to update this article as we learn or receive more information and the two products continue to mature. Both Splunk and ELK stack are designed to be highly efficient in log collection and search while allowing users to create visualizations and dashboards. The similar goal and purpose of the two platforms naturally means that many of the concepts are also similar. One minor annoyance is that the concepts are referred to by different names. Thus, the table below should help those that are familiar with one platform map ideas and concepts to the other. In many ways, even the architecture between Splunk and ELK are very similar. The diagram below highlights the key components along with the names of each component in both platforms. That said, which enterprise-critical features aren’t included in the open source or even basic free license? 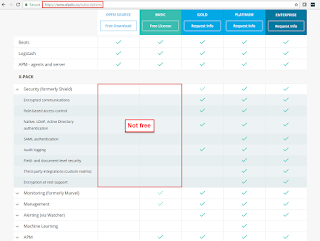 The subscription comparison screenshot found below shows that one extension not included for free is Security (formerly Shields). This includes Encrypted communications, Role-based Access Control (RBAC), and even authentication. Most would argue that an enterprise needs a login page and the ability to control who can edit vs. view searches, visualizations, and dashboards, thus it is not a fair comparison to say that Splunk costs money while ELK is free. There are alternatives to X-PACK, but we will leave that to another article since it is not officially developed and maintained as part of the ELK stack. In terms of host much Splunk costs vs. ELK, there are also many arguments there--some of which include the cost of build time, maintenance, etc. It mostly depends on your skills to negotiate with each vendor. Welcome to part II in our series covering how to use rsyslog to route and forward logs to Splunk. Please see Part I of the series (http://securitysynapse.blogspot.com/2019/01/rsyslog-fun-basic-splunk-log-collection-part-i.html) for the basics in opening ports, routing traffic by IP address or hostname, and monitoring files to send the data on to Splunk Indexers. As a reminder, choosing between rsyslog, syslog-ng, or other software is entirely up to the reader and may depend on their environment and approved/available software. We also realize that this is not the only option for log architecture or collection, but it may help those faced with this task—especially if rsyslog is the standard in their environment. That said, let's look at some more advanced scenarios concerning file permissions, routing logs via regex, and routing logs via ports. We will wrap up with some helpful hints on a possible method to synchronize the rsyslog and Splunk configuration files. Another more advanced rsyslog option is the ability to drop or route data at the event level via regex. For example, maybe you want to drop certain packets -- such as Cisco Teardown packets generated from ASA's. Note: this rsyslog ability is useful since we are using Splunk Universal Forwarders in our example and not Splunk Heavy Forwarders. Or maybe you have thousands of hosts and don't want to maintain a giant list of IP addresses in an if-statement. For example, maybe you want to route thousands of Cisco Meraki host packets to a particular file via a regex pattern. Possibly even more challenging would be devices in a particular CIDR range that end in a specific octet. I know we just provided you the ability to route packets via regex, however sometimes that can be inefficient--especially at high events per second. If you are really fortunate, the source sending the data has the ability to send to a different port. Then it may be worth looking into routing data to different files based on port. The example file below provides port 6517 and 6518 as an example. Since our architecture in part I outlined using a load balancer and multiple rsyslog servers, we will eventually need a way to synchronize the configuration files across the multiple rsyslog servers. The example below provides two bash shell scripts to perform just that task. The first one will synchronize the rsyslog configuration and the second will synchronize the Splunk configuration--both scripts restart the respective service. Note: This is not the only method available for synchronization, but it is one possible method. Remember to replace <other_server> with the actual IP or FQDN of that server. On the rsyslog server that you make the changes on, create these two bash scripts and modify the <other_server> section. Once you make a change to the rsyslog or Splunk UF configuration, run the necessary script. In this article, we outlined key advanced features within rsyslog that may not be immediately evident. Hopefully this article will save you some Googling time when trying to operationalize log collection and forwarding using rsyslog in your environment. After all, eventually you will probably need to deal with file permissions, routing logs via regex and/or port, and configuration synchronization. We hope you enjoyed the article and found it useful. Feel free to post your favorite tips and tricks in the comments section below. Happy Splunking! We found it a bit surprising that there are so few articles on how to use an rsyslog server to forward logs to Splunk. This provided the motivation to write this article and hopefully save others some Googling. 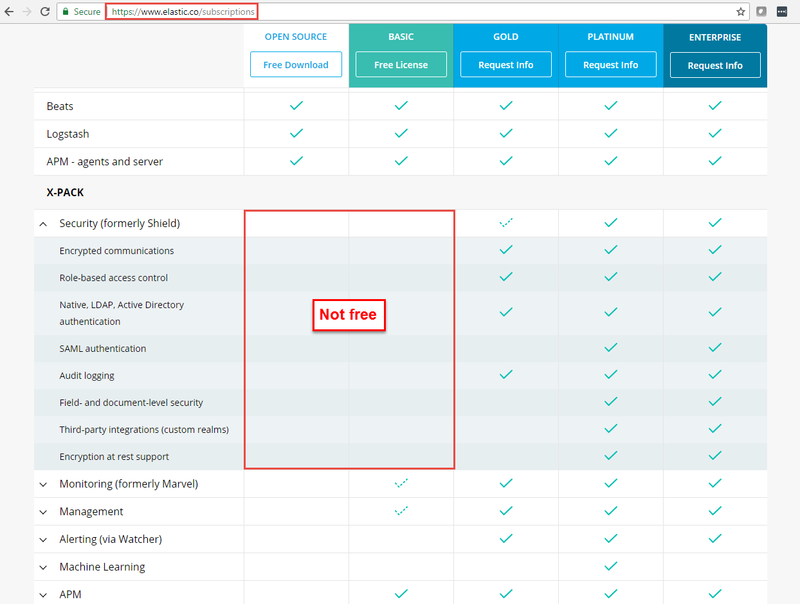 Choosing between rsyslog, syslog-ng, or other software is entirely up to the reader and may depend on their environment and approved/available software. We realize that this is not the only option for log architecture or collection, but it may help those faced with this task—especially if rsyslog is the standard in their environment. Before we jump in, we wanted to remind you of three potential gotchas that may thwart your success and give you a troubleshooting migraine. If something is not working the way you expect it to work, it is most likely due to one of the three items mentioned above. It could be worth temporarily disabling them until you get everything working. Just don’t forget to go back and lock it down. Note: We will also be using Splunk Universal Forwarders (UF) in this article. Universal Forwarders have very little pre-processing or filtering capabilities when compared to Heavy Forwarders. If significant filtering is necessary, consider using a Splunk Heavy Forwarder in the same fashion as we are using the UFs below. Whether your Splunk instance is on-prem or it is in the cloud, you will most likely need syslog collectors and forwarders at some point. The architecture diagram below shows one potential configuration. The number of each component is configurable and dependent upon the volume of traffic. If you are fortunate enough to be able to route network traffic to different ports, you may be able to reduce the if-then logic shown below for routing the events to separate files. In this case, we were not able to open separate ports from the load balancer, thus we needed to do the routing on our end. In the next article we will cover more advanced routing to include regex and traffic coming in on different ports. Note: If the rsyslog server sees the hosts by their hostname instead of IP address, feel free to use $fromhost == '<hostname>' in the configuration file below. The rsyslog servers in our setup are not intended to store the data permanently. They are intended to act as a caching server for temporary storage before shipping the logs off to the Splunk Indexers for proper long-term storage. Since disk space is not unlimited on these caching servers we will need to implement log rotation and deletion so we do not fill up the hard disk. Our rsyslog config file already takes care of the log rotation with the template parameter specifying the name of the file as “%$YEAR%-%$MONTH%-%$DAY%.log", however, we still need to clean up the files, so they don’t sit there indefinitely. One possible solution is to use a daily cron job to clean up files in the /rsyslog/ directory that are more than x days old (where x is defined by the organization). Once you have some files in the /rsyslog/ directory, try the following command to see what would potentially be deleted. The command below lists files in the rsyslog directory that are older than two days. If you are happy with a two-day cache period, add it to a daily cron job (as shown below). Otherwise feel free to play with the +1 until you are comfortable with what it will delete and use that for your cron job. Splunk Forwarders are very flexible in terms of data ingest. For example, they can create listening ports, monitor directories, run scripts, etc. In this case, since rsyslog is writing the information to a directory, we will use a Splunk UF to monitor those directories and send them to the appropriate indexes and label them with the appropriate sourcetypes. See our example configuration below. Note: Make sure the indexes mentioned below exist prior to trying to send data there. These will need to be created within Splunk. Also ensure that the UF is configured to forward data to indexers (out of the scope of this write up). Pro tip: Remember to restart the Splunk UF after modifying files. A simple Splunk search of index=cisco, index=pan_logs, or index=lastchanceindex should be able to confirm that you are now receiving data in Splunk. Keep monitoring the lastchanceindex to move hosts to where they need to go as they come on-line. Moving the hosts is accomplished by editing the rsyslog.conf file and possibly adding another monitor stanza within the Splunk UF config. This process can be challenging to create, but once it is going, it just needs a little care from time to time to make sure that all is well. We hope you found this article helpful. Happy Splunking! If you are reading this page chances are good that you have both Splunk and Infoblox DHCP. While there is a pre-built TA (https://splunkbase.splunk.com/app/2934/) to help with the parsing, we needed some visualizations, so we wrote them and figured we would share what we created. Figure 1: At the time of writing this article, only a TA existed for Infoblox DHCP. If you have this same situation, hopefully we can help you too. As a bonus, we will include the dashboard code at the end of the article. Fortunately, our job is taken care of by the Infoblox TA (https://splunkbase.splunk.com/app/2934/)! Just use the sourcetype of infoblox:dhcp to ensure it is properly parsed. Combine a few panels together and we will have a dashboard similar to the one in the dashboard code section at the bottom of the article. Even though we only had a Splunk TA (and not an app to go with it), we used the flexibility provided within Splunk to gain insight into Infoblox DHCP logs. We hope this article helps other save time. Feel free to leave comments in the section below. Happy Splunking! If you are reading this page chances are good that you have both Splunk and Infoblox DNS. While there is a pre-built TA (https://splunkbase.splunk.com/app/2934/) to help with the parsing, we needed some visualizations, so we wrote them and figured we would share what we created. Figure 1: At the time of writing this article, only a TA existed for Infoblox DNS. 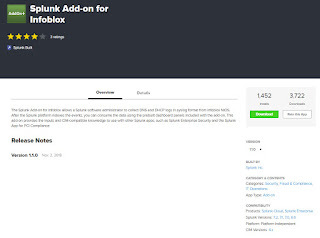 Unfortunately, the Infoblox TA (https://splunkbase.splunk.com/app/2934/) does not seem to parse all the fields, but it might get you relatively close. Just use the sourcetype of infoblox:dns. 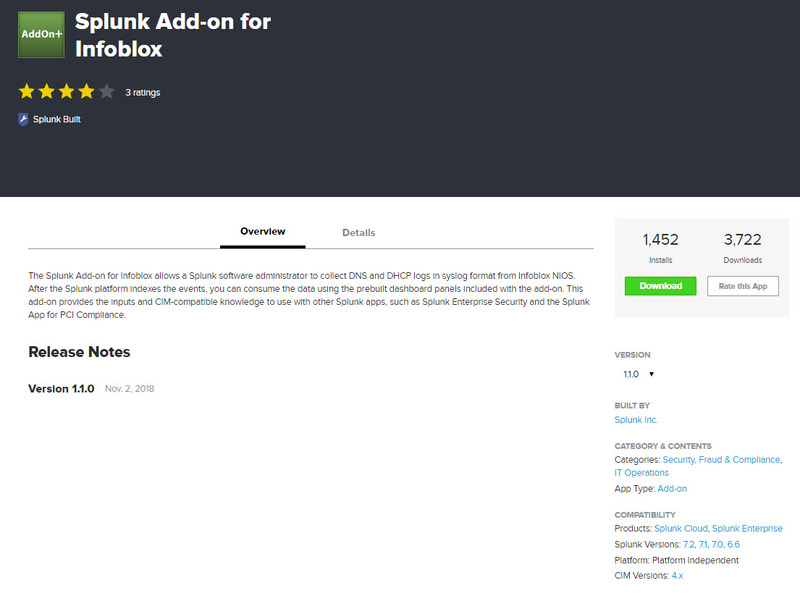 Even though we only had a Splunk TA (and not an app to go with it), we used the flexibility provided within Splunk to gain insight into Infoblox DNS logs. We hope this article helps other save time. Feel free to leave comments in the section below. Happy Splunking!